Retired hosts’ date and time of retirement now displayed・encoding option added to check-log etc. Here at Hatena, we’re having a Halloween TGIF on the last Friday of October. On this day, some staff members will even spend the day dressed up in costume. Take a peek into the conference room and you might see a few monsters sitting down to a serious meeting... It’s a really fun day. The date and time of retirement is now displayed in the host's details of the retired host. This can be used in host management for investigating hosts that were unintentionally retired. 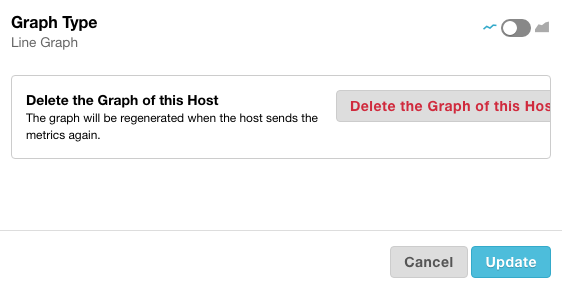 Graphs in the host details can be deleted from the configuration screen accessed from the gear icon located on every custom graph. Before this, the delete function was specified to remove the entire organization’s graph definition and was not able to delete a specific graph of a specific host. With this update, deleting a graph will only delete the graph displayed, making the operation more intuitive. If you would like to delete a graph from the entire organization as before, delete the graph definition from https://mackerel.io/my/graph-defs. To everyone who submitted pull requests, thank you very much! An encoding option has been added to check-log. With this, log check monitoring can be done specifying Japanese strings even with environments such as Windows. For possible specifications for the encoding option, refer to this README. check-ntservice has been added. By using this, check monitoring of Windows services can be done. For more details on how to use this, refer to the following README. The method of obtaining interface metrics with Windows has been modified. As a result, the problem of not being able to obtain interface metrics depending on the environment has been fixed. Since the metric name has changed when the method of obtaining was modified, if you were able to obtain the interface in previous versions, please note that metrics might be collected as different metrics when the version is updated. A custom prefix has been added when posting host metrics from mkr, to match the behavior of the agent.